I still have a book of mine that appears to be typed on an old fashioned type writer from over 30 years ago. Why do I still have it? It has my name in the story line! I have held on to that book as being one of those super special memories of childhood. I had no clue how my name, street name and friends all ended up in this book, that looked like any other book! Those fantastic memories are easier to make with technology today, but I don't think the thrill has lessened any with seeing your name in a book. 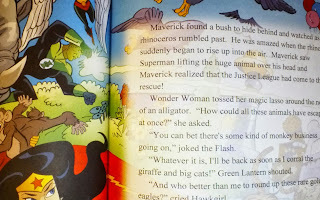 My 6 year old is thrilled with Justice League. Can't blame him much with 4 older brothers, he has grown up with Superman, Batman and others. 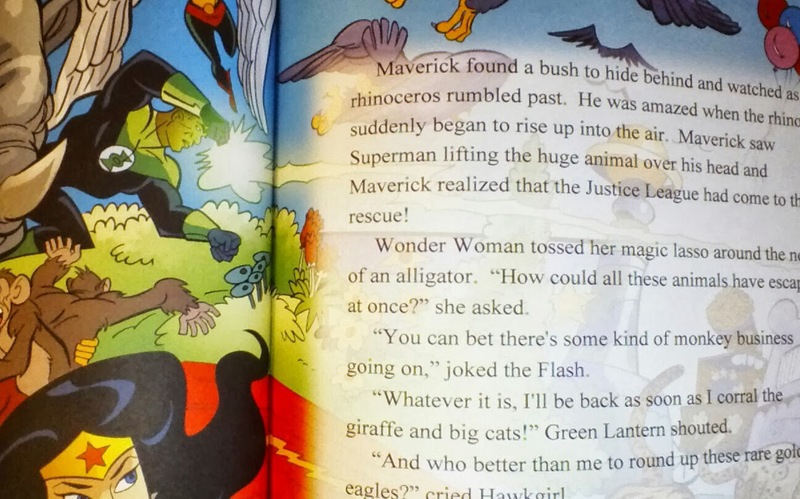 I was super excited to see that KDNovelties had a Justice League hardback book that could incorporate Maverick's name into the story line. For just $14.95 I am able to bring him some of those fantastic moments that I experienced as a child. That covers just about all that kids are interested in. The only other one I could think of would be to have more animal stories, or maybe even careers. KDNovelties is hosting a giveaway for new FB fans! Become a fan www.facebook.com/KDNovelties) and write on their wall telling them Jubilee Reviews sent you! They will give you a private exclusive page to enter for a chance to win a personalized Mother Goose book with nursery rhymes music CD. 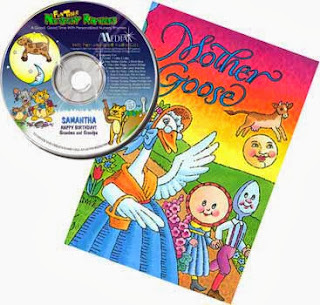 Love the varieties and the books and CDs are always great! Personalized books are great! Kids love seeing their names in the story. It's even better now that they have characters they love, too.